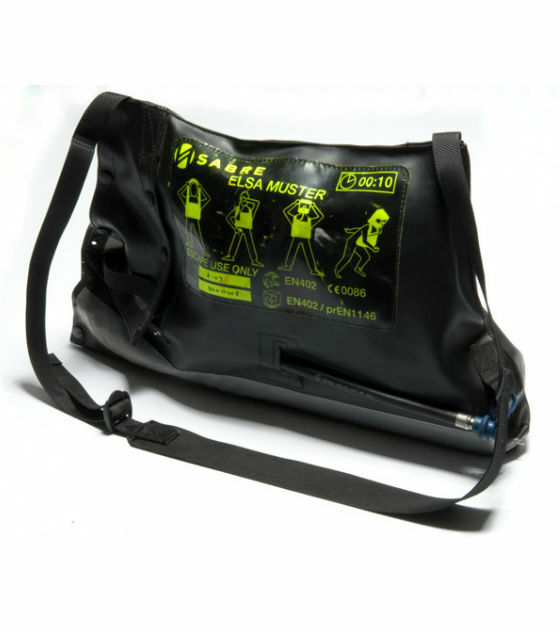 The 3M Scott Safety ELSA Muster is an open circuit, positive pressure airline breathing apparatus generally comprising; Anti-static bag, high pressure reducing valve, automatic positive pressure demand valve and coupling for airline supply hose. The ELSA Muster range offers durations of 10 and 15 minutes and is available in either facemask or positive pressure hood options. Moulded in non-dermatitic materials and fitted with an optically clear, impact resistant polycarbonate visor. Anti-scratch coating, speech diaphragm and side mounted, quickfit demand valve connection are standard. Supplied with head harness. Worn in chest or bandolier mode, the Elsa Muster carrying bag is available in black anti-static material for use in potentially explosive atmospheres. ELSA Muster positive pressure escape breathing apparatus complete with bag mounted 2.0 litre, 200 bar steel cylinder to EC specification providing 400 litres breathing air giving a rated duration of 10 minutes*. Pressure reducing valve and automatic positive pressure demand valve; Positive pressure facemask in black Neoprene with net headharness: carrying bag in black Anti-static material. Emergency air in connection with CEN male coupling. 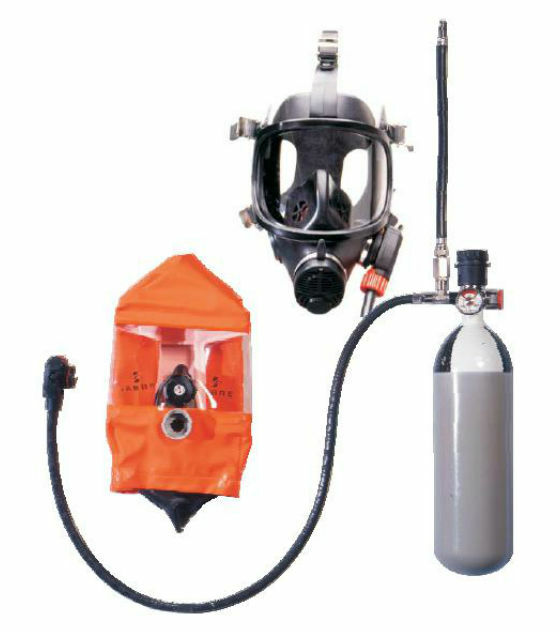 ELSA Muster positive pressure escape breathing apparatus complete with bag mounted 3.0 litre, 200 bar steel cylinder to EC specification providing 600 litres breathing air giving a rated duration of 15 minutes*. 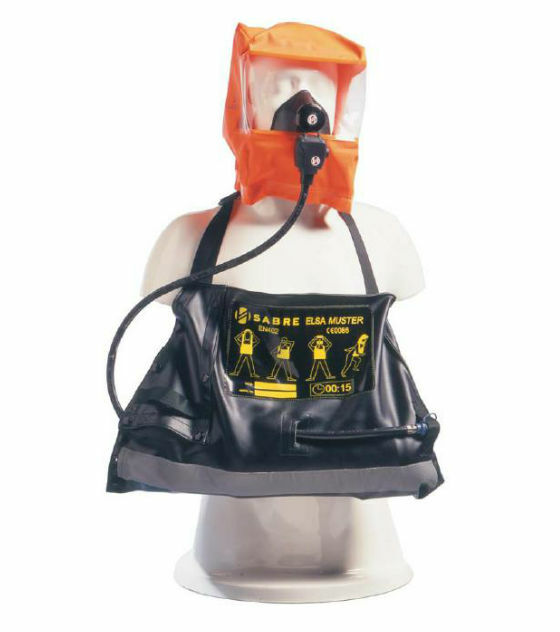 Pressure reducing valve and automatic positive pressure demand valve; Positive pressure facemask in black Neoprene with net headharness: carrying bag in black Anti-static material. Emergency air in connection with CEN male coupling. ELSA Muster positive pressure escape breathing apparatus complete with bag mounted 3.0 litre, 200 bar steel cylinder to EC specification providing 600 litres breathing air giving a rated duration of 15 minutes*. Pressure reducing valve and automatic positive pressure demand valve; Positive pressure hood high visibility flame retardent PVC coated nylon; carrying bag in black anti-static material. Emergency air in connection with CEN male coupling.